Rolling off the ferry into Qingdao I was immediately struck by how much less polluted the city seemed to be, being on the coast helps I guess. 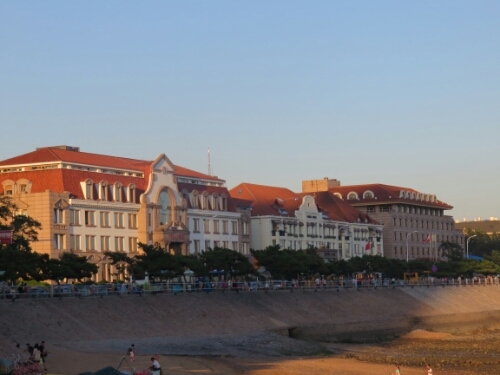 Qingdao was also a quite unusual city by Chinese standards maintaining a lot of its own individual character. Part of this character is informed by its history as a German concession and there is a lot of European architecture remaining in the old part of the city. Indeed the hostel I chose was housed in a building that had formerly been a church. 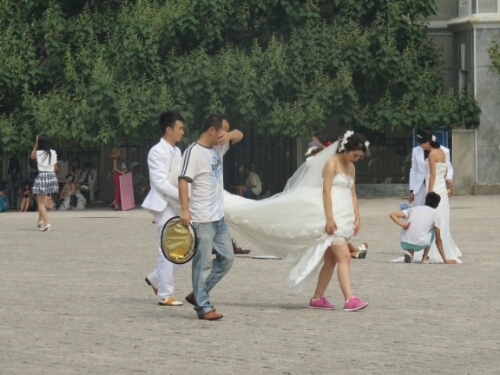 One interesting thing I saw in Qingdao was scores of couples getting their wedding photos done outside St Michael’s Cathedral. I’ve never seen so many brides and grooms in one place and they were all dressed up and posing in various places around the church. Some of the colour schemes for the wedding clothes were interesting to sat the least. 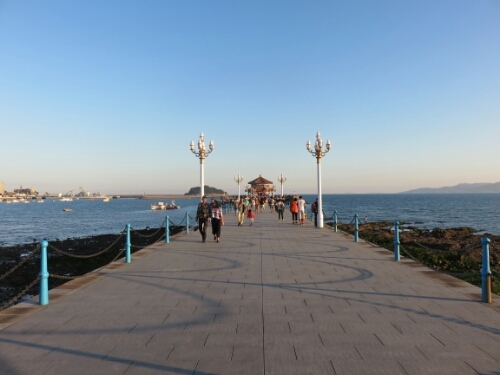 All in all I really liked Qingdao; the people I met were very friendly and the coastal location was very pretty and in general the area I was staying in had a nice relaxed feel to it that I hadn’t felt in many other places in China. I ate some good food and met some nice people and was generally recharged for the next stage of my journey. I even had some Tsing Tao beer which originates in Qingdao – it is definitely a lot more potent there than in the rest of China. Sadly at the back of my mind there was always the knowledge that my bike was broken so while there I tried to get it fixed. I wanted to try before I got to Korea in case it wasn’t possible there as well. Unfortunately the place recommended by the hostel: a Trek shop really wasn’t equipped to deal with bent steel forks. The mechanic there was able to change my brake pads but didn’t seem to have the tools for even for checking my bottom bracket which seemed strange. 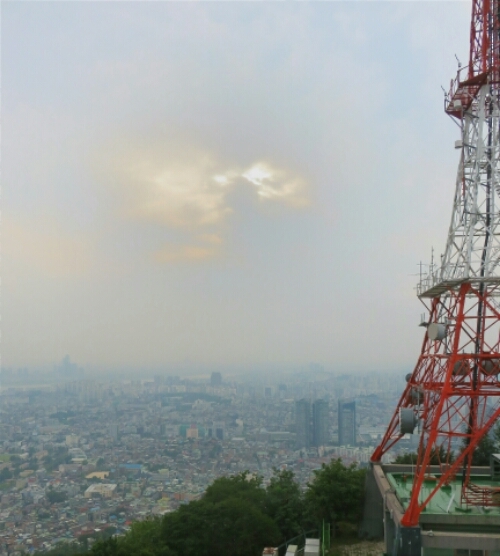 Being unable to get my bicycle fixed in China meant that I was now relying on Seoul to have the answers. As the second largest city in the world I hoped someone would be able to help. 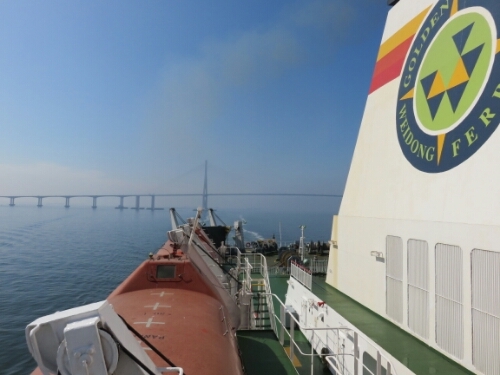 So after a day in Qingdao I packed my stuff and rode off to get the ferry to Korea. 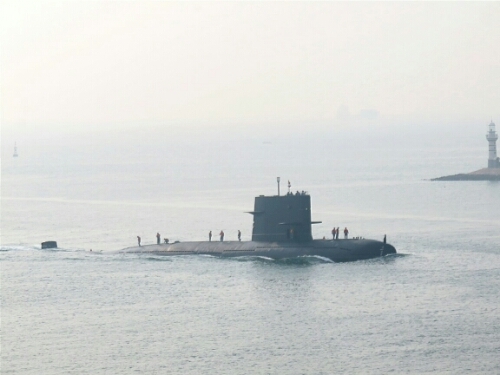 This turned out to be fairly simple – I’d called ahead and booked my ticket over the phone when I arrived in Qingdao, selecting the economy class berth. I was wondering if this was wise as for 720 yuan I would be sharing a room with over 50 other people. 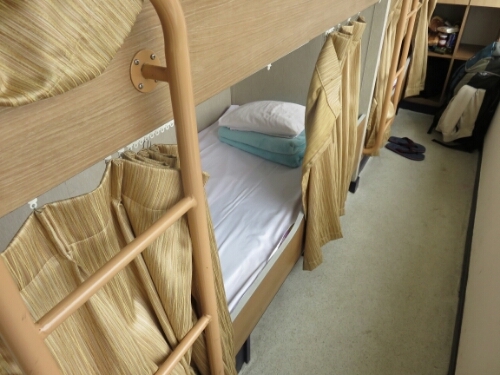 For an extra 100 yuan I could have gone business class with only three other room mates. I’d made my decision though and I didn’t change it when I collected my ticket confident that if the place was terrible it would at least be an experience. As I collected my ticket I noticed another couple of cycle tourists also waiting for the boat. They turned out to be Will and Johan another pair of Brits attempting to cycle round the world. They, like me, had taken the northern route through central Asia just differentiating on the route through the different countries. Will and Johan though were going incredibly fast. I had left the UK in August 2013, they had left in April 2014 and had already caught me up, which is an incredible achievement. It was a bit of a relief to see them as well as it meant that I wouldn’t have to deal with any issues on my own as we were all cycle touring we were going to be metaphorically and hopefully literally in the same boat. Passing through customs and out of Chinese immigration presented no problems except that annoyingly they made us put our bikes on a bus to get to the boat. It would probably have been safer to let us just ride rather than manhandle our heavy tourers up onto the vehicle. Safety though really went out the window when we had to get our bikes on the boat. I think in our heads all three of us had been picturing a boat similar to the Dover Calais ferry we had come across on. A boat where we could ride our bikes into the car deck and just leave them there. Our ferry it turned out was not a car ferry – it was only for passengers. There was no car deck for us to ride onto. We ended up having to manhandle our bikes and up stairs and a couple of escalators, which was quite precarious with us almost losing them back down to the bottom. In hindsight we should probably have unloaded them and taken the luggage and bikes up separately but at the time the ferry people seemed in a bit of a hurry so we just tried to rush our things up. Once our bikes were locked in a store room it turned out that while I was going to economy class Will and Johan had gone for a Royal class cabin for the two of them. Which was only 200 yuan more each than my ticket but meant they had their own cabin with shower and toilet and TV. I wandered off slightly nervously after we agreed to meet in the bar later. In the back of my mind I had pictures of the previous overnight boats I had taken, which were all experiences but not always hygienic ones. I was imagining toilets that you wouldn’t want to enter without rubber boots on and that I would be sleeping on a mat on the floor packed in with scores of other people. I was thus very pleasantly surprised when it turned out to be quite nice. I had my own little curtained off bunk that was larger than some of the beds I had slept in. It even had a light and its own plug socket. The toilets were very clean and more what you would expect in a department store than on a ship. I managed to get a good night’s sleep and wasn’t too jealous of Will and Johan’s cabin. From the ship we saw some interesting things including a Chinese submarine sailing in to park or dock or whatever and another incredible bridge. 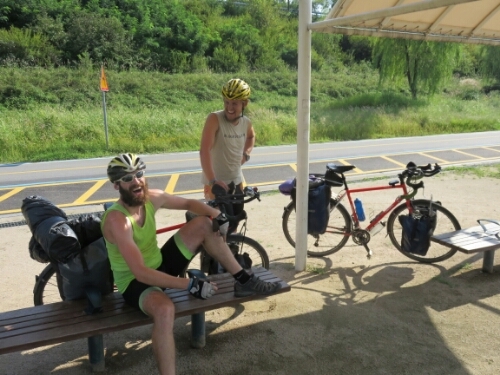 The next morning we disembarked slightly more safely than we had gotten on board the ship and decided to ride together across Seoul until it was necessary for us to part – me to ride to my friend’s and the guys to continue there journey without pausing for Seoul. The Korean roads immediately felt nicer than China; there was less pollution, a red light seemingly meant stop every time rather than when you felt like it and the surface was good. 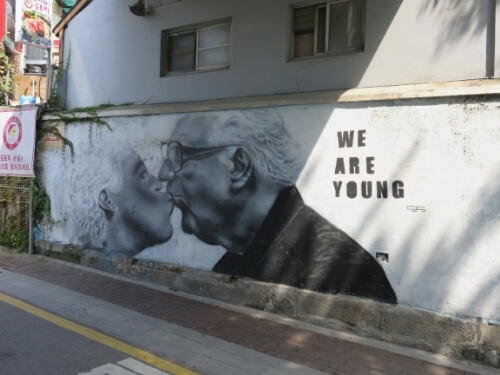 Unfortunately Johan got an unpleasant initial welcome to Korea’s roads. As he was navigating he was up front so he came first upon what seemed like a wet patch in the road. Unfortunately it wasn’t water but a massive thick patch of oil and as soon as his bike made contact with it it went out from under him. Luckily both he and the bike were OK but it was pretty shocking and the first time I’ve ever seen something like that. It’s lucky we were a few metres apart or we’d have all probably been in a big heap. After that early setback things only got better. And soon Johan had led us off the roads and onto an amazing cycle path. It had been a while since I had seen a real cycle path and the ones in Seoul have so far been amazing. Pretty much every bit of river or canal seems to have a well maintained two lane path running along it making cycle travel a pleasure. It was amazing and we were able to rip along at incredible speeds even with all the other cyclists using the lanes. Sadly our speed meant that it was all too soon time for us to part as I headed towards the northern part of the city. Although brief it had been fun riding with some other British cycle tourists after so long. I should mention that they are riding in order to save the rhino from illegal hunting as you can see from their blog here. Alone I managed to navigate the city,helped by the excellent cycle paths and reached my friends flat. Here I wasn’t yet able to rest as my friend had at my request been looking for a good bike mechanic in Seoul, which they had found. Unfortunately as it was going to be a Korean holiday for the next few days we had to go now or I’d miss my chance unless I hung around in Seoul for almost a week. So after a quick shower I changed back into my dirty cycle clothes and headed to where my friend said the shop was. They’d be taking the bus. I wasn’t holding out much hope a few separate people had already said that I would probably need a totally new front fork as it looked pretty twisted but at least I could still ride at the moment. Arriving at the mechanics before my friend who was coming to translate I managed to get across what was wrong as the guy had some English. He also seemed to be pretty switched on and to really know bikes and it wasn’t long before he had a better idea than me what the problem was (not hard). The mechanics in China I had taken my bike to hadn’t really seemed to have much of a solution or an idea where to start. 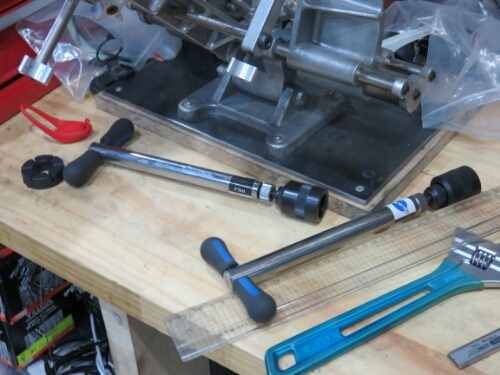 This guy very quickly had the forks clamped in a tool I’d never seen before which seemed to be expressly for the purpose of straightening them. After some adjustment he checked the alignment and didn’t look happy and pointed out that it wasn’t just the forks that were bent but the whole of the steering column. He said I would need a whole new fork, this wasn’t the news I wanted but was not unexpected. So I tried to work out from him if I just needed to replace the fork or anything else as well. While I was doing this he asked how long my friend would be and when I said I didn’t know he took another look at the bike as if to say ‘well, may as well give it another go’. Next thing he had taken the whole fork out. It was really easy to see the bend in the steering column when he did this and I wished I had gotten a photo. At the time I was just happy he hadn’t given up. With the fork in hand he disappeared round into his work area to try and work some magic. My friend then arrived and next thing I know I am being interviewed. One of the other people who had been in the shop turned out to be a reporter for a Korean magazine – I’d thought the three other people beside the guy helping me with my bike were staff members too. It turns out they were just his friends. So now that there was an interpreter here in the shape of my friend one of them was keen to ask me questions about my trip so she could write an article on it. I’m not sure if anything will come of it and I’m not sure how interesting my answers were as I was pretty distracted by what was happening with my bicycle! While this was going on the mechanic had been steadily working away and suddenly he came round the side with a fork that looked to be in much better shape. I could feel hope coursing through me which I tried to stamp down to avoid disappointment if it wasn’t actually fixed. Putting it all back together I took it out for a test and miraculously it was better. Not perfect but a hundred times improved, it no longer pulled to the right at all and felt much more like it had done. I was incredibly grateful and couldn’t believe he had actually done it. I hadn’t realised until then how much of a dampener having to worry about my bike had put on the trip. I felt free again and that there was nothing stopping me from getting round the rest of the world. I didn’t have to worry about being in one place to receive a bike part I would probably have to order and I didn’t have to worry about steering left to compensate for the next however many kilometres! The reporter and her boyfriend were then kind enough to invite us to go and watch world championship mountain biking on a big screen at another location. So off I went following them on my bike while my friend took a taxi to the venue. They were considerate enough to ride slowly for me as they were clearly used to going a bit faster. Their bikes were so light they probably weighed less than one of my wheels and the reporter had shown me a youtube clip of her winning a women’s keirin cycle race which was a bit intimidating! 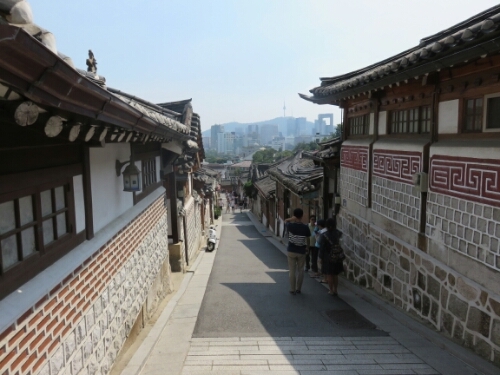 The next day my friend took me round Seoul which seemed a lot nicer than I remembered it. Having a local to take you round does mean you get to see some nicer stuff! Coming to Korea from China felt like when I went from India to Singapore. Moving into some futuristic place where people use rubbish bins everywhere, most buildings are finished and a no smoking sign actually means no smoking. Sadly as with my last transition from the developing to the developed world I could now no longer afford as much, as a coca cola seemed to have quadrupled in price for example. Hopefully that will change as I leave the capital! Ooh. I am off to Korea from 21 September to cycle. Your posts make me more excited. They have amazing cycle paths here, really well thought out.